‘Kar ghor hath dian unglian te’ by Bulleh Shah is a deep poem on the practical aspect of this world, the world which may look like the same but every individual has his own nature and temperament which is quite different from every other individual; therefore, Bulleh Shah asserts that “fingers of a hand are different”. Both, good and bad, coexist in this world. Someone dies in the love of a person while another one murders several people just for the assertion of his own being’s superiority. Bullah expresses his concerns for the difference that exists in human nature. Out of the multitudes of humans, there are few that dwell in our hearts forever and others are forgotten the moment they part from us. 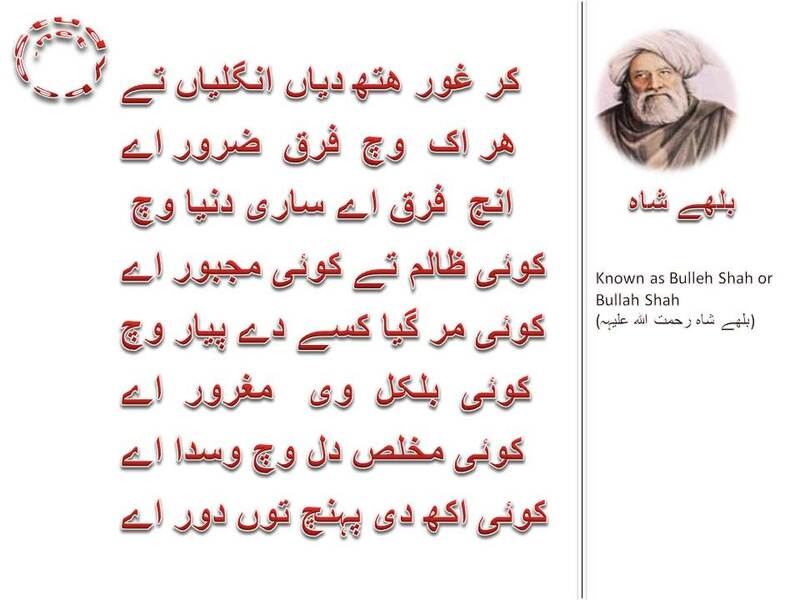 The poem is a thought provoking message from Bulleh Shah that we can attain immortality by virtue of being noble and not by being influential or powerful. So ‘love your fellow beings’ is the theme of Bullah’s poem.